This jumbo car magnet is perfect for cookie season! Let everyone know your Girl Scout is selling! Green with colorful text, measures approximately 9" x 12". Passersby can't miss it! Once it goes on the side of your car, you will be selling cookies like crazy! This jumbo car magnet is perfect for cookie season! Let everyone know your Girl Scout is selling! White with green text, measures approximately 5" x 7". Passersby can't miss it! Once it goes on the side of your car, you will be selling cookies like crazy! This jumbo car magnet is perfect for cookie season! Let everyone know your Girl Scout is selling! White with bright text, measures approximately 12" x 12'. Passersby can't miss it! Once it goes on the side of your car, you will be selling cookies like crazy! 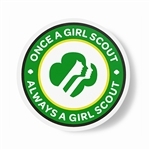 Imprinted with "Once a Girl Scout Always a Girl Scout" and Girl Scout profiles. Magnetized rubber and UV coated poly vinyl. 31/2" round. Made in USA.